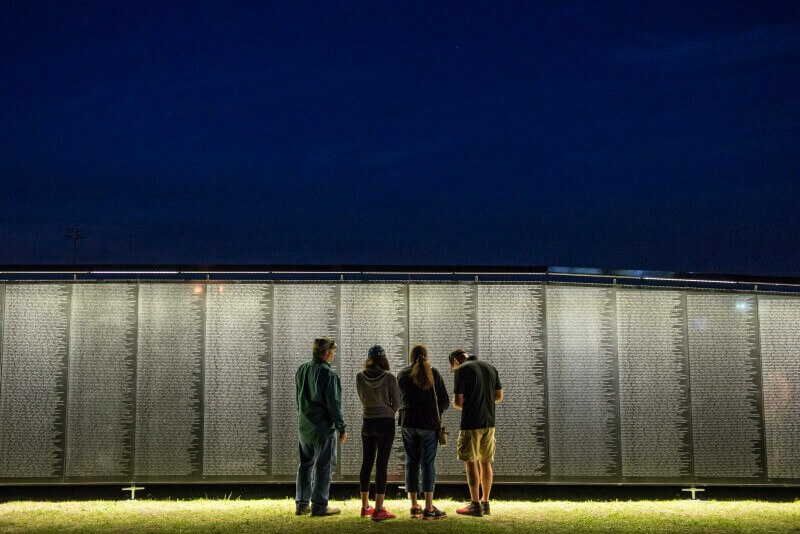 Washington, D.C. – The Vietnam Veterans Memorial Fund (VVMF) has announced The Wall That Heals national tour schedule for 2018. The Wall That Heals exhibit includes a replica of the Vietnam Veterans Memorial along with a mobile Education Center. The 2018 tour will begin on March 1, 2018 in Portland, Texas and visit nearly 40 communities during the year. The traveling exhibit honors the more than three million Americans who served in the U.S. Armed Forces in the Vietnam War and it bears the names of the more than 58,000 men and women who made the ultimate sacrifice in Vietnam. The Vietnam Veterans Memorial is one of the most visited memorials in our nation’s capital, with nearly 5.3 million visitors each year. However, many Americans have not been able to visit what has become known to many as “The Wall.” VVMF, the nonprofit organization that built The Wall in 1982, wants to give all veterans and their family members across America an opportunity to see the Memorial. The 2018 national The Wall That Heals tour is hauled through a partnership with the Truckload Carriers Association (TCA) and the trucking industry and is generously sponsored by USAA. More than 250,000 people visited The Wall That Heals in 2017. Since its debut in 1996, the exhibit has been on display in nearly 500 U.S. communities in addition to an April 1999 tour of the Four Provinces of Ireland and a visit to Canada in 2005. Hosting The Wall That Heals provides a community with a multi-day experience that includes an educational experience for local schools and organizations on the history of the Vietnam era and The Wall. The exhibit includes the Wall replica and a mobile Education Center comprised of: digital displays of photos of service members whose names are on The Wall; letters and memorabilia representative of items left at The Wall in D.C.; a map of Vietnam and a chronological overview of the Vietnam War. The exhibits tell the story of the Vietnam War, The Wall and the era surrounding the conflict, and are designed to put American experiences in Vietnam in a historical and cultural context. TO VOLUNTEER WHEN THE WALL THAT HEALS COMES TO LIVINGSTON COUNTY, CLICK HERE.